This legal primer is intended to be a basic legal resource for activists and legal observers involved in protests at or around railroads, ports, and energy facilities. Use this guide to help you understand what you are getting into before taking any action. If you are arrested, you are obligating yourself to the federal and/or state criminal legal system, which may have consequences that include a conviction, jail, and/or probation. Act accordingly. If you are not able to deal with the consequences of an arrest and stand in solidarity with your community against government repression, don’t risk arrest. Activism can take many forms, so be honest with yourself about how you can be most effective in fighting for climate justice. Download Railroads, Ports, and Utilities Legal Primer as a PDF for printing. This Primer is meant to supplement Know Your Rights training from the Civil Liberties Defense Center and does not include a discussion of the most common charges and punishments that activists will face from criminal trespass, disorderly conduct, criminal mischief, etc. Each State has different laws that may apply to actions on railroad, port, or energy facility property. This primer focuses on Washington and Oregon and is not meant to replace diligent research by campaigns in these or other states. Do your Research! Railroad tracks, and usually the land extending up to 50 feet on either side, are private property of railroad corporations. Railroad police have interstate jurisdiction and can investigate and enforce all state law crimes against the railroad whether or not the officers are on railroad property. There are special state and federal charges that may be brought against protesters interfering with railroads and trains. Disabling, wrecking, or derailing any on-track equipment or vehicle, as well as making tracks, depots, bridges, tunnels, signals, warehouses, etc., unusable or unworkable, qualifies as a “terrorist attack” under this statute. You may also be charged under this statute for removing, damaging, or impairing a dispatch, crossing, or control signal, as well as interfering with drivers, engineers, or conductors with a reckless disregard for safety. It’s also important to note that collecting information, surveiling, photographing, videotaping, or diagramming railroads or equipment to assist in any of this behavior may also qualify as a “terrorist act,” as does attempting, threatening, conspiring, or conveying false information about an attempt to do any of the above. This is a Class C felony punishable by up to 20 years in prison and/or fines. Despite its name, this charge covers lots of railroads. Injuring or destroying national-defense material, premises, or utilities is a crime, as long as you have the intent to injure, interfere with, or obstruct national defense. It’s also a crime to attempt to do so. “Materials, premises, and utilities” include any railroad that might carry defense materials or troops — which could be most railroads. It’s a crime to enter a train with the intent to injure property or a person, whatever that injury might look like. This is a Class A misdemeanor punishable by up to 1 year in prison (injury to property or person) or a Class C felony punishable by up to 20 years (robbery or murder), and/or a fine. State Charges also exist for railroad-specific behavior. This charge is pretty broad and criminalizes obstructing, hindering, or delaying a railroad car. This is a misdemeanor punishable by up to 90 days in jail and/or a $1,000 fine. Tampering with any railroad equipment or structure is a crime in Washington. Railroad structures include embankments and culverts. Technically, you have to tamper in a way that endangers the safety of the property or people. Also note that throwing a “dangerous missile” at a railcar is covered by this statute. This is a Class B felony punishable by up to 10 years in state prison and/or a $5,000 fine. “Rolling stock” means something rolling along a railroad track. If you take, remove, damage, alter, or interfere with any part of a railcar, and you intend to injure the railcar or deprive its owner of it, you may have committed this crime. This is a Class C felony punishable by up to 5 years in state prison and/or a $1,000 fine. Some states do not have any special charges dealing with railroads or trains, but railroad protests may still attract special legal attention. In Oregon, entering or remaining on railroad yards, tracks, bridges, or rights of way automatically constitutes Criminal trespass in the first degree, a Class A misdemeanor punishable by up to 1 year in jail and/or a fine of $6,250. Interfering or obstructing the service of a railroad, or using, rearranging, manipulating, or damaging railroad property automatically constitutes Criminal mischief in the first degree, a Class C felony, punishable by up to 5 years in prison and/or $125,000 fine. Other States have different statutes or laws; make sure to research your state laws. 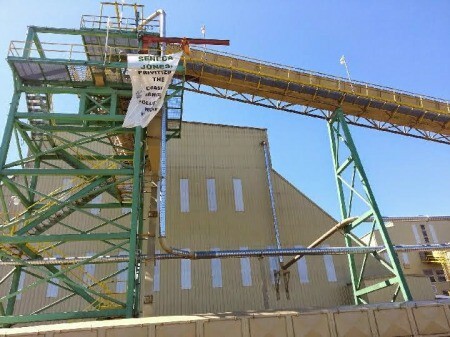 In a series of labor protests in 2013 at the new EGT grain station in Longview, WA, a strong union town, union members broke down fences, blocked trains and even released the grain cargo during their protests. The most common charges that were pursued against the activists were Criminal Trespass and Obstructing or delaying train (see above). Most of the other charges (such as disorderly conduct, obstructing a police officer, malicious mischief) were dismissed, and the others ended in plea deals or trials (with some juries refusing to find guilty verdicts). Punishments mostly consisted of community service and fines. *Special rules apply to union labor struggles and actions. 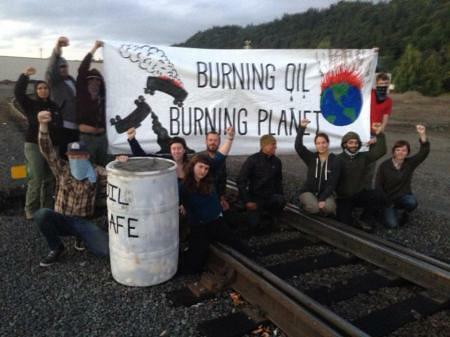 In September of 2013 and April 2014, 5 to 20 activists in Missoula, MT blocked the path of a coal train by standing close enough to the tracks to make it unsafe for the train to pass. They were given a warning to clear the tracks and told that those who remained would be cited. Those who were cited primarily faced charges of trespass and disorderly conduct. The train was slowed, but it was not stopped. Note: Across the country, Criminal trespass remains the most common charge for activists involved in railroad actions. Keep in mind that, as in other types of actions, protesters may also be charged with criminal trespass, criminal mischief, disorderly conduct, or public nuisance. Probation terms and restitution are common punishments for climate justice actions, but they are not often reported. Ports are considered separate municipalities chartered by the state (like a city or a town). Port property is likely either owned by the port municipality, a corporation, or private individuals. State law applies in ports, but some federal charges may also apply because ports are considered critical infrastructure of commerce. Ports, like other municipal entities, have their own police forces to investigate and enforce laws concerning port property, which may include inland port property. As with railroads, there are special state and federal charges that may be brought against protesters conducting actions at ports. Boarding a vessel before it has completely moored—that is, before it has come to a rest at port—is a crime. This is a Class B misdemeanor punishable by up to six months in prison and/or a fine. We saw this one under railroads, too. The charge covers injuring or destroying national-defense material, premises, or utilities, which can include port facilities. You have to have the intent to injure, interfere with, or obstruct national defense. It’s also a crime to attempt to do so. “Materials, premises, and utilities” covers docks, wharves, piers, bridges, dams, canals, locks, boats, or buildings that could potentially be involved in moving defense material or troops. State Charges are less common for port activity. Some states may have different statutes or laws, be sure to research your state laws. This charge covers obstructing the navigable portion or channel of a harbor, bay, river or stream in any way. This is a misdemeanor punishable by a fine up to $300. Note: some states, like Oregon, do not have any special charges dealing with ports. But, again, protesters may face typical activist charges such as criminal trespass, criminal mischief, disorderly conduct, or public nuisance. Also, if you enter a boat or building with the intent to commit a crime, you may be charged with felony burglary. Research the laws in your state. 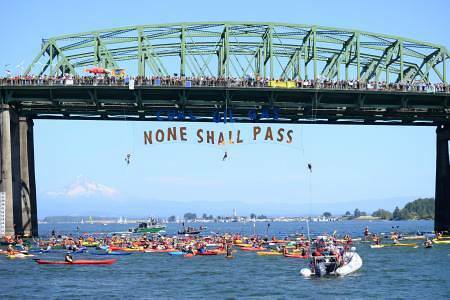 On December 12, 2012, Occupy activists successfully shut down the Port of Portland. There were no charges for activists at the shut-down itself (others were arrested away from the protest site for unrelated crimes). Two people locked down to equipment and delayed the departure of Megaload shipments at the Port of Umatilla on December 2, 2013 (on inland port property). They faced charges of disorderly conduct. The labor action described above under Railroads took place on port property in Longview and Vancouver, WA. Utilities, public utilities, or energy facilities are the infrastructure producing or transmitting energy to the public, or the companies that own such infrastructure. Electricity, gas, oil, water, and sewage are all utilities. Although usually privately owned, utilities enjoy special legal protections because of their importance to the general public. There are special federal charges that may be brought against protesters interfering with utilities. Contrary to its name, this charge covers more than just “destruction.” It’s also a crime to damage a facility involved in the production, storage, transmission, or distribution of energy, or to attempt to do so. This includes pipelines, whether or not they are under construction or operational. If this damage causes a significant interruption in the facility’s production (or if you cause over $100,000 in damage), this is a Class C felony punishable by up to 20 years in prison and/or a fine. It’s a Class E felony punishable by up to 5 years in prison and/or a fine if you cause up to $5,00 in damages and no significant interruption. Note: this charges applies even to facilities that are not functional — either under construction or off-line. We saw this in the railroad and ports sections. The charge covers injuring or destroying national-defense material, premises, or utilities. You have to have the intent to injure, interfere with, or obstruct national defense. It’s also a crime to attempt to do so. “Materials, premises, and utilities” includes electric plants, lines, gas mains, pipes, poles, buildings, or structures supplying energy to national defense premises or armed forces. There are lots of national defense premises and lots of armed forces, so this includes a lot of utilities. Damaging or destroying an interstate gas or hazardous liquid pipeline facility, or a pipeline used in interstate commerce — meaning it must cross a state line, which most pipelines do — is a crime. So is attempting to do so. States may not have special charges dealing with utilities. However, in Washington, causing an interruption or impairment in utility service by physically damaging or tampering with utility property automatically constitutes Malicious mischief in the first degree, a Class B felony punishable by up to 10 years in prison and a fine of $20,000. Causing a substantial risk of such interruption or impairment by damaging or tampering with utility property automatically constitutes Malicious mischief in the second degree, a Class C felony punishable by up to five years in prison and a $10,000 fine. In Oregon, interfering or obstructing the service of a utility, or using, rearranging, manipulating, or damaging utility property automatically constitutes Criminal mischief in the first degree, a Class C felony, punishable by up to 5 years in prison and/or $125,000 fine. In Asheville, North Carolina in February 2012, Greenpeace members climbed fences to access a Progress Energy Facility, locked down to equipment, and hung a banner from the top of an inactive smokestack. Sixteen people were arrested and charged with trespass and a few with breaking and entering. In July 2012, the Oakridge 3 cut through three fences at Y-12 Nuclear Storage Facility in Oak Ridge, Tennessee and vandalized the outside of a building. They were charged with a variety of crimes but were ultimately convicted of damaging national defense premises (see above). One of the activists, a nun, received 3 years in prison. The two others, who had longer criminal histories, were sentenced to 5 years. Some of the Green Scare activists were charged with 18 U.S.C. § 1366 (Destruction of an energy facility) for a sabotage action that toppled Bonneville Power Administration power lines in December 1999. They were not convicted of this crime because plea deals were made. Note: It’s worth repeating: in addition to the charges listed above, protesters may face typical activist charges such as criminal trespass, criminal mischief, disorderly conduct, or public nuisance. Always remember that it’s hard to predict what charges prosecutors will bring. Just because they didn’t pursue a certain charge this time doesn’t mean they won’t in the future. Recognize that actions such as making plans, scouting, threatening, attempting, and conveying false information are often covered by the charge. Do your legal research in advance of any potential arrest scenario. You are not allowed to lie to cops, but they are allowed to lie to you (and you should expect them to do so). Keep your hands visible and don’t make quick movements. Don’t go anywhere with a cop unless you are under arrest. Stay in well-lit areas and where witnesses are present. Assume that you are being recorded by the cops. If possible, record the cop or have someone else do so. It is legal to record cops in a public place if you inform them that you are recording and you aren’t interfering with their business. Be polite but firm about asserting your rights. The police interfere with people’s rights in three distinct ways: Conversation, Detention, and Arrest. Identify your situation so you know your rights, and note that if a cop gives you a warning or an order and you disregard it, you may be arrested. Anything you say can and will be used against you, so stay calm and in control. Police ofï¬cers have the right to approach and ask you questions, but absent any reasonable suspicion that you are involved in criminal activity, an ofï¬cer cannot detain you. You do not have to answer any questions. You do not have to provide identiï¬cation to an ofï¬cer at this level unless you are driving a motor vehicle; this includes non-US citizens. Minors (under 18 years of age) do not have to answer any questions by police unless a parent or attorney is present. Determine if you are in a Level I situation by asking if you are free to leave. If you are free to leave, leave. If an ofï¬cer reasonably suspects you have been involved in a crime, they may detain you for questioning. You must identify yourself upon request at this level (name, address, D.O.B.). In most states, you do not have to produce an ID card unless you are the driver of a vehicle. Giving false information is a crime. Do not consent to a search, but if the police have probable cause or a warrant (which you should ask to see), they do not need your consent. But never verbally consent. Repeat: “I do not consent to this search.” Police may pat down your clothing if they have a reasonable suspicion that you are carrying a concealed weapon; do not physically resist but make it clear that you do not consent to any further search. Do not talk to the police. Say: “I invoke my Fifth Amendment Right to remain silent. I want a lawyer.” Police are allowed to lie to you, and anything you say (as well as complete silence) could be used against you and provide the police with probable cause to arrest you. Don’t run away even if you believe what is happening to you is unlawful; this may lead to your arrest and injury. Remember ofï¬cers’ names and badge numbers, and write down everything about the incident as soon as possible. Ask for an attorney immediately upon being taken into custody. Repeat this demand as often as necessary. You have the right to remain silent—wait for your attorney before saying anything. In most circumstances, if you refuse to provide a name and address while in custody, you will not be eligible for release or a court-appointed attorney.Within a reasonable time, the police must allow you to make a phone call to your attorney and may not legally listen to that call (but assume they will! ).Do not talk to fellow arrestees regarding the circumstances of the arrest; you never know who might be listening/recording or if you’re actually talking to an informant or undercover officer. You must be provided adequate medical care while in custody. If you are on medication, inform the jail of that fact immediately and repeatedly, in writing if possible. If you have dietary restrictions for health or religious reasons, the jail may be required to provide you with alternative meals. Inform the jail of your dietary needs as soon as you arrive. If the jail fails to accommodate those needs, begin the grievance process immediately. Transgendered people have the right to be safe while in custody. Inform jail staff of issues of concern. Either while in custody, or shortly upon your release, you will be required to appear in court for an arraignment hearing. Plead NOT GUILTY to all charges. Apply for a court-appointed attorney if you so choose. You will receive a future court date to appear. Make contact with your attorney as soon as possible. It is your responsibility to remain in contact with your attorney; this may be frustrating, but will be essential to your defense! If you choose to go to trial, it may be your responsibility to locate and secure witnesses on your behalf. If you are found guilty at trial, or elect to later plead guilty, you are allowed to delay sentencing at least 48 hours. At the sentencing hearing, you may be ordered to serve jail time, so be prepared to report to jail immediately. Probation requires you to obey all laws. A subsequent arrest while on probation could result in a separate probation violation case and additional punishment including jail. Don’t Brag: You’re engaged in activism to protect the planet from further destruction, not to get cool points. Bragging about actions—past, present, or future—puts you and your community at risk. The government may use bragging to gather information about you, your comrades, and actions, and it may also decide to target you for getting more information. This applies to “real life” as well as electronically. Government agencies closely monitor email, Facebook and other websites, cell phones, and all electronic communications. Don’t Gossip: Like bragging, gossiping creates a weak link through which the government can gather information about a community to use against it. Additionally, gossip opens up opportunities for the government to exploit or even create disagreements and tensions between activists. Even if the government doesn’t use your gossip to do damage, you may do that anyway; gossip can easily lead to good activists dropping out of movements. Online gossip can be especially damaging to individuals and communities, and most issues that arise within activist communities don’t need to be broadcast to the public and the government. Operate on a “Need to Know” Basis: Only share information with others that NEEDS to be known, and only share the information with the people who NEED to know it. Any further sharing creates the unnecessary risks of information getting shared with informants, people who will snitch, and people who did not want the responsibility of knowing information. Furthermore, when you are sharing sensitive information with select individuals, be aware of who—and what—is around you. Don’t share information in the presence of anyone who does not need to know it, or in the presence of any electronic devices, security cameras, places that could be wired, etc. Infiltrator: one who enters into a group or territory with hostile intent, usually with backing from a government agency or corporation. Informant: one who provides information about an individual or a community to a government agency or corporation. Provocateur: one who is employed by a government agency or corporation to create problems in a community and/or to encourage a community or individual members to engage in violent actions. Snitch: one who turns their back on their community and takes on one or more of the above roles. Assume that infiltrators, informants, and provocateurs are within any given activist community and respond accordingly. Be on the lookout for suspicious behavior from others, and adhere to security culture practices to help reduce the damage that these unwelcome parties can cause. If someone seems to have come out of nowhere, asks too many questions, stirs up unnecessary dissent, creates harmful gossip, pressures others to engage in violent activities, or behaves in other ways which suggest that they do not care about what is best for the cause, other activists, and the community—don’t trust them. They may be working for the government or a corporation that is eager to gather information about activists and to try to make effective groups fall apart. In addition to being cautious about the danger posed by people who’ve been paid to work their way into activist communities, you should be careful about trusting people who may one day snitch. If for any reason you think that someone would not be able to withstand pressure from the police, FBI, or other government agency—or you think that someone would be tempted by offers of reduced sentences or money for turning on their comrades—don’t freely share information with them. Contact CLDC to arrange a training or series of trainings for your community. If you appreciate activist resources like this primer and our Know Your Rights trainings, please consider becoming a member of the Civil Liberties Defense Center or make a donation to support CLDC’s work. Check out https://cldc.org/donate/ for more information about how you can help. I do not agree to perform any test, consent to any searches, or participate in any line-ups. I will not sign anything unless my attorney agrees I should do so. * For explanatory purposes: “The words “national-defense material” include arms, armament, ammunition, livestock, forage, forest products and standing timber, stores of clothing, air, water, food, foodstuffs, fuel, supplies, munitions, and all other articles of whatever description and any part or ingredient thereof, intended for, adapted to, or suitable for the use of the United States in connection with the national defense or for use in or in connection with the producing, manufacturing, repairing, storing, mining, extracting, distributing, loading, unloading, or transporting of any of the materials or other articles herein before mentioned or any part or ingredient thereof. The words “national-defense premises” include all buildings, grounds, mines, or other places wherein such national-defense material is being produced, manufactured, repaired, stored, mined, extracted, distributed, loaded, unloaded, or transported, together with all machinery and appliances therein contained; and all forts, arsenals, navy yards, camps, prisons, or other installations of the Armed Forces of the United States.